The new masters’ of the 21 st century, best in fine art investments? Sail Training vessel, Shearwater, measures 40 x 61 cm (16″ x 24″), oils, by Gordon Frickers, a timeless painting that would give you pleasure every time you see it upon your wall ~ commissioned by Mr. Chris Fagg, sold. 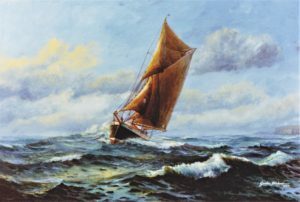 I, we, chose to show this heavy Ketch, originally schooner rigged, working her way up the English Channel off the East Sussex coast passing The Firehills, near where my client lived and for a while near my home when I was at Rye. I first saw this ‘Shearwater’ as she was leaving a mooring in Falmouth harbour, by backing her square topsail letting go for’ard, making stern way, then with rudder on opposite turn, she spun around smartly, head and mainsails were promptly sheeted home almost in the blink of an eye, the backed topsail was tacked, braced home tight and away she went as lively as you could like..
She may still be sailing although very old. As we know, normally oil paintings are very long lived. 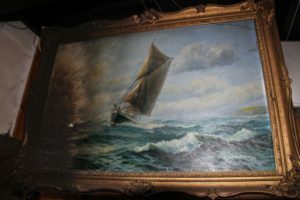 Of this painting yes it saddens me to see “Shearwater off the Firehills” so ruined. Uninsured, the painting was never replaced. This reminds us, oil paintings should after 6 months be varnished and should always be covered by your insurance. If in doubt about either of those 2 issues feel free to contact me to protect your investment, for your professional guidance and peace of mind. Had it lived, today it would be worth at the very least £4000 at auction although I’d have replaced it for 3. The original was painted, commissioned by a friend who still lives at Hastings, East Sussex, as a gift for a friend of his. The ‘Firehills’ seen as coastline in this painting are a well know day mark for navigators. For most of the year they appear from sea, a yellow orange similar to the colour of sunflowers. The colour comes from the flowers of wild very prickly shrubs we call gorse, native to the South East English coast. The hills stretch from Hastings in the west to near Winchelsea in the east with villages including Fairlight and Broomham in the hinterland. The Fairlight Hills are mostly national park so invite walking with fine views from the cliff tops of shipping in the English Channel, a coast formally dotted with sailing vessels of every type from men of war to glorious clippers and dirty British coasters with salt caked smoke stacks. On a very clear day one can see the French coast some 72 miles away. ‘Shearwater’, you may know is species of sea bird. This ‘Shearwater’ was built at Looe 1911 as a schooner, being altered to a ketch in 1929, as you see her here. For many years she worked as The Falmouth Sail Training Ship, (http://www.falmouth-sail-training-ship.org/history/) I last saw her at Falmouth around 1973.